Wal-Mart's website is selling a Team Ico compilation for the PlayStation 3 that doesn't officially exist. Rumors that Sony plans to release HD remakes of Ico and Shadow of the Colossus for the PlayStation 3 have gained further momentum today, following the appearance of a listing for the compilation on Wal-Mart's website. The listing has almost no information other than the names of the two games, the platform and the price. The collection costs just under $40, and can be pre-ordered now for delivery on April 1st 2011. It seems unlikely that this is an April Fool's prank - it's much too bizarre - and an April release date would align quite nicely with rumors from earlier in the year that suggested a Q1 2011 release for the compilation. Obviously, this is just rumor at the moment, but it's the kind of rumor that's pretty easy to believe. 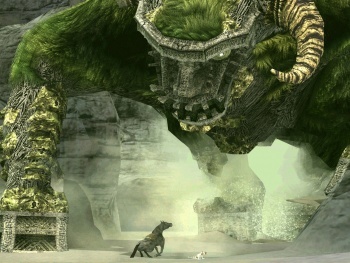 Team Ico director Fumito Ueda has been open about his desire to see Ico and Shadow of the Colossus on the PS3, and Sony Worldwide boss Shuhei Yoshida said that the company is working on more HD updates of PS2 titles. Sony has said that it is aware of the demand for such a compilation, so hopefully this listing will turn out to be genuine.